Fire up the skillet and get this chicken sauteing in the herbed butter. Once the chicken is cooked through, thicken up the sauce with some sour cream and spoon it over the chicken on each plate. Enjoy! Soften the butter and gently mix in the basil and thyme. Reshape into stick of butter and slice to spread onto chicken. In a large skillet, add the olive oil and brown the chicken on both sides. Spread the herbed butter onto the chicken and let melt. Simmer over medium heat for 4 to 5 minutes, then pour in the chicken stock, flip the chicken and simmer for another 4 to 5 minutes, or until chicken is cooked through. Once the chicken is cooked through, remove it from the skillet and then whisk in the sour cream to thicken the sauce. 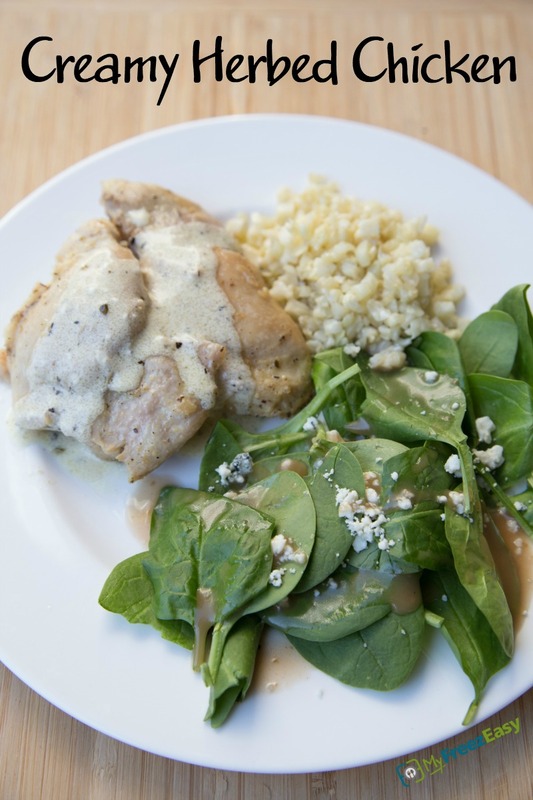 Serve chicken with creamy sauce over the top. Cook the cauliflower rice, as directed. 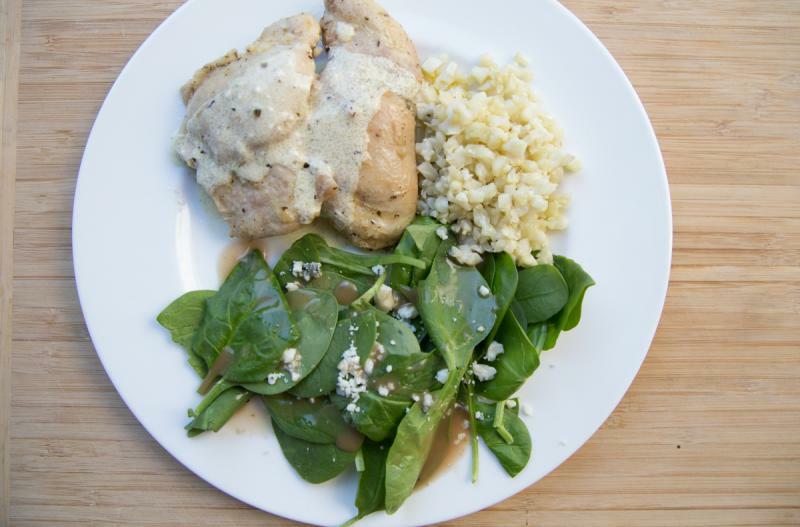 Serve Creamy Herbed Chicken with cauliflower rice and spinach. Combine 8 Tbsp softened butter with 2 tsp basil and 2 tsp thyme. Do not add the chicken stock or olive oil to the freezer tray. Put tray in the freezer and freeze up to 6 months in fridge freezer or 12 months in a deep freezer. Thaw in the fridge overnight, or a warm shallow dish of water for about 20 minutes, before transferring to the skillet to cook. Add the olive oil, then brown the chicken thighs with herbed butter and add the chicken stock and cook as directed. Use a dairy-free margarine for a dairy-free meal. Thaw completely. Heat the olive oil in a skillet, then brown the chicken thighs with herbed butter and add the chicken stock. Simmer until chicken is cooked through. Serve with cauli-rice and salad.